Media • Organizers of Save The Tribune blast "secret" deal with church-owned Deseret News that diverts Tribune revenue to it. 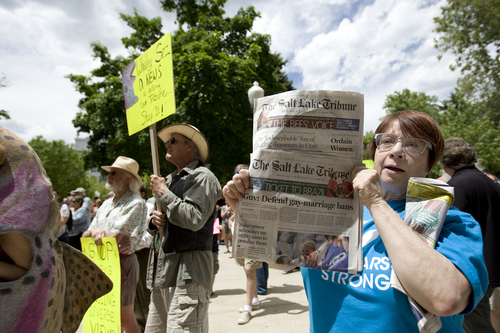 Melissa Majchrzak | Special to the Tribune Pamela Thomas holds a sign in support of the Salt Lake Tribune at the "Save the Tribune" rally, held at the City and County building in Salt Lake City on May 31, 2014. 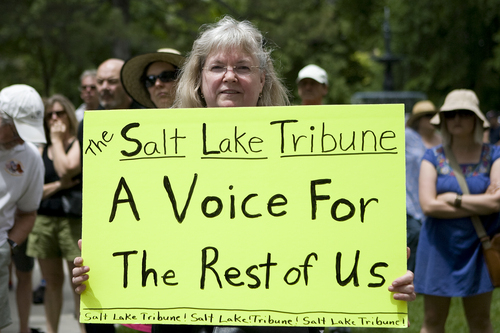 Melissa Majchrzak | Special to the Tribune People stand in support holding signs at the "Save the Tribune" rally, held at the City and County building in Salt Lake City on May 31, 2014. 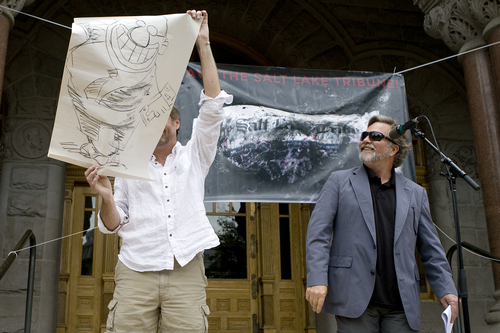 Melissa Majchrzak | Special to the Tribune Kent Frogley holds up a cartoon by Tribune cartoonist Pat Bagley at the "Save the Tribune" rally, held at the City and County building in Salt Lake City on May 31, 2014. Melissa Majchrzak | Special to the Tribune Gina Fisher holds copies of the Salt Lake Tribune at the "Save the Tribune" rally, held at the City and County building in Salt Lake City on Saturday. 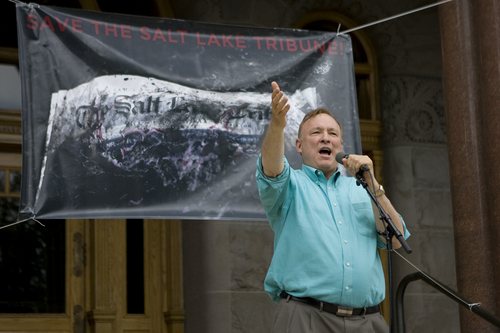 Melissa Majchrzak | Special to the Tribune Sen. Jim Dabakis speaks to the crowd at the "Save the Tribune" rally, held at the City and County building in Salt Lake City on May 31, 2014. 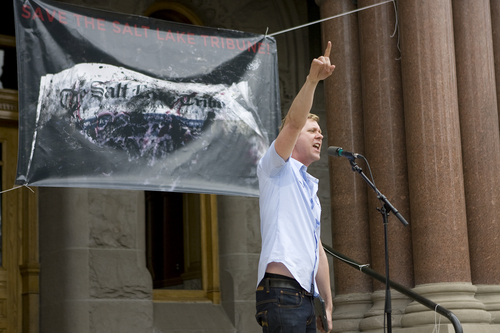 Melissa Majchrzak | Special to the Tribune Troy Williams speaks to the crowd at the "Save the Tribune" rally, held at the City and County building in Salt Lake City on May 31, 2014. Melissa Majchrzak | Special to the Tribune Joan O'Brien speaks to the crowd at the "Save the Tribune" rally, held at the City and County building in Salt Lake City on May 31, 2014. 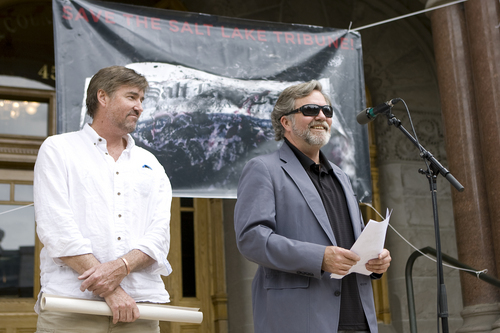 Melissa Majchrzak | Special to the Tribune Kent Frogley and Tribune cartoonist Pat Bagley speak to the crowd at the "Save the Tribune" rally, held at the City and County building in Salt Lake City on May 31, 2014. 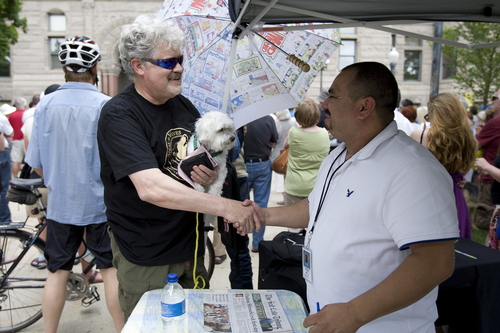 Melissa Majchrzak | Special to the Tribune Ray Mathews signs up for a subscription to the Salt Lake Tribune at the "Save the Tribune" rally, held at the City and County building in Salt Lake City on May 31, 2014. Matthews works for the Utah State Library and purchased the subscription for them, as they had previously stopped their subscription. 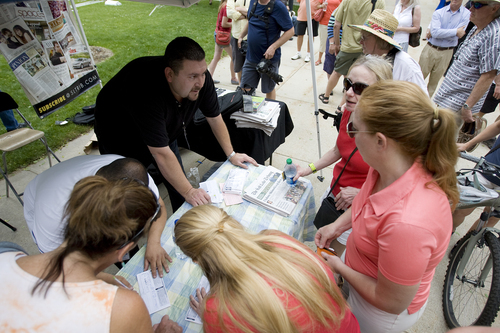 Melissa Majchrzak | Special to the Tribune People stand in line to sign up for a subscription to the Salt Lake Tribune at the "Save the Tribune" rally, held at the City and County building in Salt Lake City on May 31, 2014. 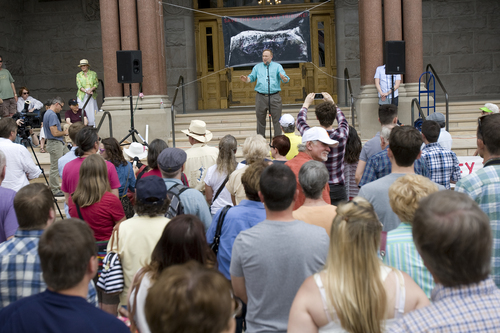 Melissa Majchrzak | Special to the Tribune Jim Dabakis, state senator, speaks to the crowd at the "Save the Tribune" rally, held at the City and County building in Salt Lake City on May 31, 2014. Melissa Majchrzak | Special to the Tribune Emily and Giovanni Nuvan hold signs in support of the Tribune at the "Save the Tribune" rally, held at the City and County Building on May 31, 2014. 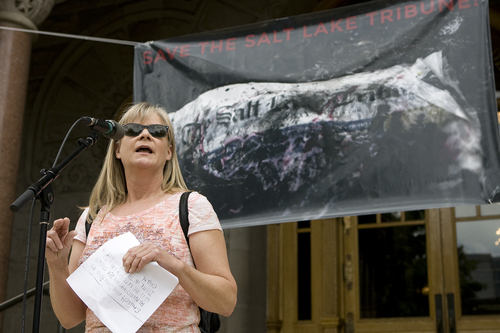 Melissa Majchrzak | Special to the Tribune Joan O'Brien speaks to the crowd at the "Save the Tribune" rally, held at the City and County building in Salt Lake City on May 31, 2014. 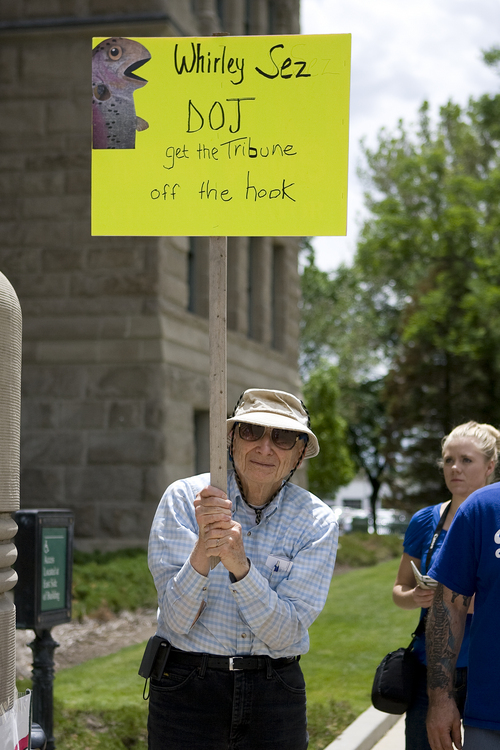 Melissa Majchrzak | Special to the Tribune William Vogel holds a sign in support of the Salt Lake Tribune at the "Save the Tribune" rally, held at the City and County building in Salt Lake City on May 31, 2014. 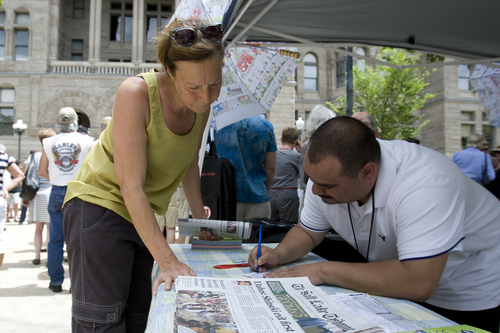 Melissa Majchrzak | Special to the Tribune Sharon Woodward signs up for a subscription to the Salt Lake Tribune at the "Save the Tribune" rally, held at the City and County building in Salt Lake City on May 31, 2014. Six decades ago, The Salt Lake Tribune&apos;s owners, then a local family, threw a lifeline to its afternoon competitor in the form of an agreement that merged the two Utah newspapers&apos; non-editorial functions and divided an enhanced revenue stream mirroring The Tribune&apos;s larger circulation. 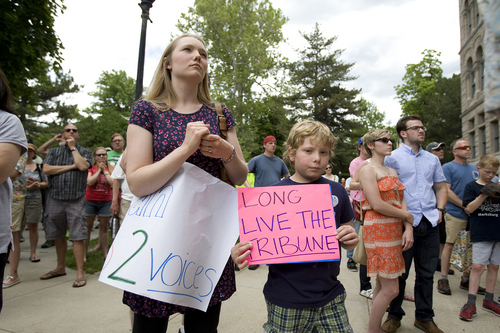 But in its latest iteration, which the Deseret News forged with The Tribune&apos;s current hedge-fund owners last fall in "extreme secrecy," the agreement reverses the revenue split in a way "calculated" to starve The Tribune, according to speakers Saturday at a Save the Tribune rally in Salt Lake City attended by at least 200 Tribune supporters. "The hedge fund gets the money, the Deseret News gets a monopoly, and Utahns get left in the dark," said organizers led by Democratic Sen. Jim Dabakis. 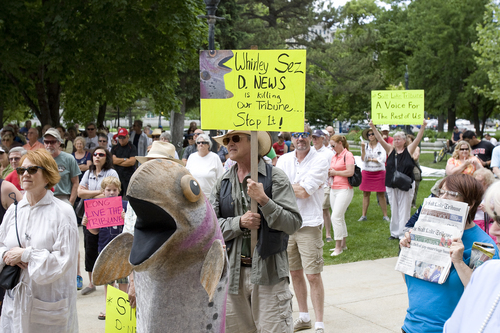 Speaking from the west steps of the historic City-County Building, Dabakis and others insisted the U.S. Justice Department invalidate the deal between the News and Digitial First Media  which manages The Tribune and many other papers owned by Alden Global Capital  as a blatant anti-trust violation that undermines the viability of the 144-year-old Tribune. "We can&apos;t live in this state without The Tribune," shouted KRCL&apos;s Troy Williams, who served as master of ceremonies and introduced speakers, including former Tribune owner Phil McCarthey, cartoonist Pat Bagley and former columnist Peg McEntee. Reader Pamela Thomas held up a sign to traffic on State Street, reading, "A voice for the rest of us." "Non-Mormons need a voice also," said the Utah native, who is a fan of The Tribune&apos;s opinion pages and columnists Robert Kirby and Paul Rolly. "Every morning I can read opinion and information that isn&apos;t connected to the church, " Thomas said. "They bring up a lot of good stuff about the [religious] divide and it opened up that dialogue." In response to a comment request to Deseret News CEO Clark Gilbert, editor Paul Edwards referred to the paper&apos;s "clarification" issued in April shortly after the deal became a public controversy. "The Deseret News remains committed to the market&apos;s demand for multiple editorial voices and the amended joint operating agreement [JOA] upholds that commitment," Edwards wrote in an e-mail. "For example, both newsrooms remain entirely independent. The Tribune pays no rent for use of the plant and presses that were purchased by the Deseret News." The News&apos; statement ignores critics&apos; central argument: that the new agreement slashes The Tribune&apos;s share of joint operating revenues from 58 to 30 percent. 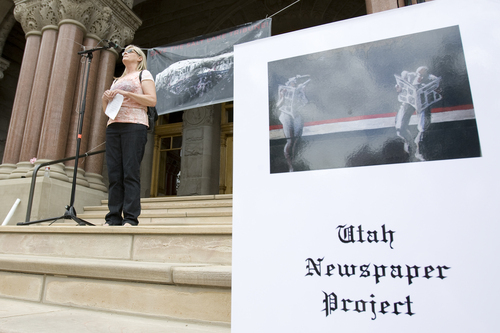 This cuts by nearly half the revenue The Tribune needs to gather and edit the news and provide a vital counterweight to The Church of Jesus Christ of Latter-day Saints, which owns the News and many other Utah news outlets, said Joan O&apos;Brien, a former Tribune reporter and a founder of the Utah Newspaper Project. It also gives the Deseret News veto power over any future sale of The Tribune and a majority representation in the jointly held company that handles the papers&apos; business operations. Even as newspapers increasingly rely on the Internet to reach readers and sell ads, O&apos;Brien said the industry still reaps 80 percent of its revenue from print. "You don&apos;t abandon print when it&apos;s paying most of the bills," said O&apos;Brien, the daughter of the paper&apos;s late publisher Jerry O&apos;Brien. "The Tribune is paying the Deseret News&apos; bills." Tribune publisher and editor Terry Orme said later in a statement: "It hurts big time to have your main revenue source cut in half. We have lost 36 positions in the last year, all good employees, many of them experienced, fine journalists. These cuts are in response to the shift in revenue." Orme added: "To say that The Tribune is on death&apos;s doorstep is hyperbole. But we are owned by a hedge fund, and hedge funds aren&apos;t known for taking the long view and investing in people and products. So this change in the joint operating agreement puts a dark cloud over our future. I think it needs to be looked at, and adjusted." McCarthey said that the re-worked JOA makes buying the paper from Alden a money-losing proposition. He said his family would be interested in re-acquiring the Tribune, but only if owning it made economic sense. Digital First CEO John Paton did not respond to an e-mailed request for comment.